"I bought a dozen of the comic books of various vintages. So I read all these things and I thought they must be out of their minds. You know, it was all so juvenile, and so then a very simple idea struck me, and that was to overdo it." One of the great highlights of 1960s television was the beloved camp classic, Batman. Even though the series itself is in video rights limbo and may well never get released to DVD (the character being owned by Time Warner and the series by 20th Century Fox), this set of documentaries will serve as the next best thing for fans of the series. Disc One features four television programs that originally aired on A&E, each running about 44 minutes. The principal feature, Batmania, is an affectionate look back at the series, with liberal clips and 1989 interviews. There's plenty of interesting information here, including the fact that the pilot had some of the worst testing scores of anything ever shown, but when it premiered the show garnered an astonishing 52 share. 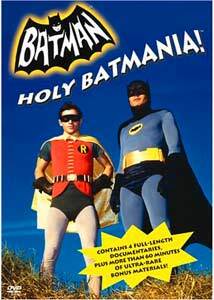 The splashy use of color, the outlandish villains, and the affectionately tongue-in-cheek scripts, combined with the dry deadpan of stars Adam West and Burt Ward, combined for a series that was hugely successful and generated a marketing bonanza. In support of the main program are three biographical documentaries of some of the principals. Adam West: Behind the Cowl provides some detail into the star's career, including the full Nestle's Quik ad in which he wittily satirized James Bond and first drew the attention of producer William Dozier. There's also significant treatment of West's typecasting and subsequent alcoholism, though the show stays generally family-friendly and doesn't get into the lurid territory that Ward's autobiography reveled in. A second biography, of Cesar Romero, is a respectful look at the Joker's lengthy career as a dancer and film and television star. The final documentary is a touching tribute to Julie Newmar, who made for an unforgettable Catwoman. The dancer's career is examined in detail, including her Broadway turn in Li'l Abner and her memorable silent performance as Stupefying Jones on stage and on film, as well as her subsequent devotion to her disabled son. Although Newmar apparently cooperated with the program (photographs were at least supplied by her), she doesn't appear in interview segments, giving it a strangely detached feeling. Surprisingly, there is zero mention of Neal Hefti, who composed the classic main theme for the program, and of Nelson Riddle, who did the arrangements and incidental themes for the series, all of which are instantly recognizable. Since music was such an important part of the series, this seems peculiar. But the main weakness of these four programs is that the Batmania program appears to have been culled in substantial part from the other three segments, leading to a great deal of repetition. Similarly, the clips from the series tend to be repeated, suggesting that the producers had access only to a limited array of them. But on the whole this is a worthwhile package for fans, and it really whets the appetite for the rights issues on the series to be worked out once and for all. Image Transfer Review: The full-frame transfer is adequate for television. The 1960s series segments look surprisingly sharp and vivid, with excellent color. The interview segments look fine. Other materials are varying in source quality, but everything is at least acceptable. Audio Transfer Review: The 2.0 mono audio sounds quite fine. The sound is quite clean, with little noise or hiss even on period materials. Not astonishing but certainly nothing to complain about. Extras Review: Fans of the series will be delighted by the second disc, which collects gobs of ephemera related to the program together. The most interesting are the screen tests of West and Ward, and for comparison, those of Lyle Waggoner (who would end up opposite Wonder Woman a few years later) as Bruce Wayne, with Peter Deyell as Robin. A generous sampling of promotional commercials, including 18 from the 1960s and a dozen from the syndication era are supplemented by the wraparound segments from a 1989 marathon of episodes, featuring West, Ward, and a still-slinky Newmar. Batman: The Movie is well-represented here by five trailers (two in Spanish). Finally, there are 16 trivia questions ranging from easy to pretty tough, at least for casual fans. It would have been nice to see the full Lookwell program discussed in the Adam West documentary, since it looks like a scream. The menus are very tough to read due to a low-contrast cursor. Despite some duplication, these programs do have merit, and the second disc provides a ton of ephemera that fans of the program will want to have.